Marshall Moore’s short story collection The Infernal Republic explored experiences of ennui and despair beneath a veneer of the absurd. 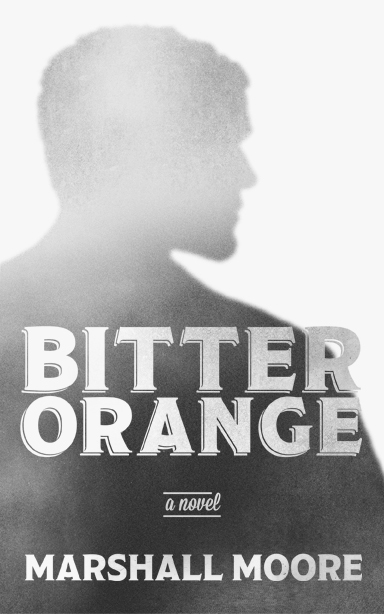 The author takes this a step further in the more sober novel Bitter Orange. The protagonist, Seth Harrington, can turn undetectable — note: not invisible, but more like he’s “stepping out of time” — in morally grey situations. He can, for example, steal a bottle of wine right under the sharp-eyed, sharp-tongued shopkeeper’s eyes, or use a one dollar bill to pay for a cell phone. It’s like a Jedi mind trick, but one that works only when doing bad things. Can such a power be used for good? Possibly, but for Seth, the question doesn’t even arise. Nor, for the most part, does the question of how to use this power to become a supervillain and conquer the world. Rather, this power exists, here’s what it seems to be able to do, now what? When you have the ability to do what you want without having to face the consequences (because no one will witness what you’ve done), what will you do? Remember being a kid and told not to do something because your mother/teacher/a police officer will catch you? For the religious, perhaps it’s the idea of an omnipresent god that deters bad behaviour. Yet, when you remove the threat of external responsibility, when you are pretty much guaranteed that you will not be caught, then the question becomes: now what? And, more importantly, so what? It’s in that “so what?” that Moore’s social commentary strikes home. Bitter Orange is set in the post-9/11 world. Like many people, Seth has been affected by the event — most of the time, the experience of shared grief is viewed as a comfort (you are not alone), yet Moore presents the less acknowledged, less explored alienating aspect of shared grief. When so many people have undergone the same thing, many of whom may have undergone worse (who can say whose grief is worse? ), where does your pain fit in, why does it matter? Seth’s power makes him fear he himself is disappearing for real, again a not-too-subtle metaphor for the feeling of insignificance (the “so what?”) created by events like 9/11. At a time when all Seth wants to do is connect, he obtains a power that sets him apart, even from his closest friends. Moore’s resolution does provide somewhat of an answer, but by no means a definitive one. Perhaps most powerful in Moore’s book is the focus not on grief or pain, but rather on what comes after. Even Seth’s powers don’t lead so much into any tortured soul-searching as to soul searching with a somewhat flat affect, deliberately so. It’s ennui, it’s pointlessness, and it’s even more soul destroying than the pain. Personally, I prefer Moore’s short fiction — the shorter format distills his message and renders it more potent. With the novel format, the story tends to meander. Subplots, such as Seth’s one-time female lover refusing to believe he’s really gay, are intriguing and do add to the plot, but they could have been more tightly integrated with the story. The ending was unexpected, but, as with the author’s less successful short fiction, Moore goes for the easy dramatic flourish. I find Moore at his best in the quiet moments, the subtle layers that reveal much more than what is said, and particularly with a subject as complex and stirring as dealing with a post-9/11 world, quiet is more telling than volume. Still, there’s a lot going on in Bitter Orange that is worth checking out, and a lot more that bears reflection even after you turn the last page. This entry was posted in Book Reviews and tagged 50BookPledge2013, Fiction, Signal 8 Press by Jaclyn. Bookmark the permalink.